Boston, MA: e-Spirit Inc., maker of the FirstSpirit Digital Experience Hub, today announced it was named to the EContent 100 list of most important companies in digital content for the fourth consecutive year. 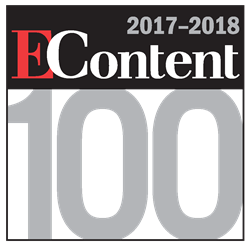 The EContent 100, announced on http://www.econtentmag.com, represents the most important companies in the digital content industry, and reflects industry trends that the publication’s editors believe will be integral to success in the coming year. EContent Magazine staff and contributing editors determine the companies included on the list based on their current standing and impact on the digital content industry. "Congratulations to all the companies named to the 17th Annual EContent 100. The names on this list are as varied as the digital media industry itself, but one of this year's standout trends was the importance of artificial intelligence. Companies in every category are finding new and innovative ways to use AI to improve their products and the end-user experience. After seeing what so many of the EContent 100 companies are up to, the judges and I can't wait to see what 2018 brings," said Theresa Cramer, Editor, EContent. e-Spirit’s FirstSpirit Digital Experience Hub, offered through a SaaS or on-premises model, helps businesses engage customers and increase revenue with personalized, content-rich digital experiences anytime, anywhere. Savvy digital marketers across all industry sectors rely on the FirstSpirit platform for individualized and synchronized content delivery across all channels to differentiate their companies and compel their users to action. e-Spirit, founded in 1999, is part of the adesso Group and has offices in 16 locations in the US, Germany, Great Britain, the Netherlands, Switzerland and Austria. Customers include international brands and corporations such as L’Oréal, Lancôme, Commerzbank, BASF, Bosch, Belk, ECCO, Urban Decay, Olympus, Santander Bank, Sterling Jewelers and many others. For more information, go to http://www.e-Spirit.com or call us at 781.862.5511.